Written by Lesia Mooney, Clinical Nurse Specialist, Mayo Clinic's Advanced Primary Stroke Center in Florida. 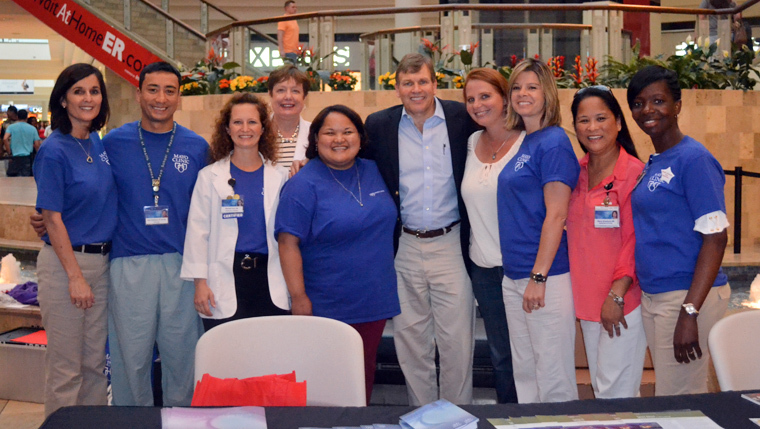 Mooney (left) with other members of the Mayo Clinic Primary Stroke Center in Florida at a community event on stroke awareness. That's the number of people annually in the United States who have a stroke. That's the number of Americans who die each year due to stroke. That’s the cost of stroke annually, which includes the cost of health care services, medications and missed days of work related to stroke. The numbers are staggering, at least according to the Centers for Disease Control and Prevention. Stroke is a major health care issue, but yet I'm still surprised by the lack of awareness surrounding stroke. There are many misconceptions about stroke, including that it’s an older person’s issue. In reality, stroke can happen to anyone, including children. I've seen patients as young as 18 and as old as 103. I've heard people tell me, “What can I do? If it’s going to happen to me, then it’s going to happen.” Or, “It’s in my blood, so why bother?” While it’s true that stroke risk increases with age, and some people are predisposed to stroke due to family history and genetics, there are many things we can do every day to reduce our stroke risk – and maybe even prevent one from ever happening. Just as smoking, obesity, lack of exercise and a high-cholesterol, high-fat diet, contribute to heart disease risk, these issues also contribute to stroke risk. So while it’s important to be mindful of what you eat and drink, aim to be active, and stop smoking, it’s just as important to be proactive in respect to other modifiable risk factors. Effective control and management of blood pressure, cholesterol and diabetes can significantly reduce your risk of stroke. Getting regular check-ups and being diligent about taking medications is crucial. But perhaps just as important, at least in my opinion, is knowing and tracking your own numbers. Take blood pressure, for instance. I tell my patients all the time: “Know your target numbers. Where are they now? Where should they be?” I encourage them to do self-checks in the grocery store before shopping. If you spot a trend – say, elevated numbers despite medication – seek medical attention. The same goes for cholesterol, weight and blood glucose levels with diabetes. Knowing your numbers and managing your activities could be the key to preventing a stroke before it occurs. May is Stroke Awareness Month. Stroke affects more than 795,000 people annually. It is the leading cause of disability in America and the fourth leading cause of death. Mayo Clinic in Florida is certified as an Advanced Primary Stroke Center by The Joint Commission, which recognizes excellence in diagnosis, prevention, treatment and rehabilitation of stroke patients. Learn about stroke services at Mayo Clinic. See services offered through the Mayo Clinic Cerebrovascular Diseases and Critical Care Group. Join the conversation about stroke on Mayo Clinic Connect.